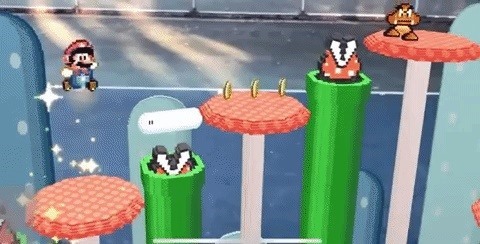 Not all remakes of video game classics turn out well, but a new augmented reality take on Super Mario is likely to draw in fans of the Nintendo hit. Created by Vancouver-based Stuart Langfield, the AR gaming experiment isn't an official release, but after seeing what's possible, I wouldn't be surprised if Nintendo seriously considers moving in this direction (no, you can't buy Super Mario AR, yet). "[The game was] built from the ground up including creation of all 3D assets, and utilizes Unity's ARKit plugin," says Langfield in a message on his Vimeo page. "A primary focal point of the production was devising innovate ways in which to impact the user experience — building something that is truly worthy of the AR format." Not only do the visuals of the AR game hold true to the original, but its creator also added a soundtrack that will immediately bring back memories for old school gaming fans. But beyond mimicking the classic's aesthetics, the experimental game makes good use of the newly immersive environment provided by AR. "Through many iterations, I created a circular game format that surrounds the player, allowing them to rotate to keep up with player movement rather than walking in a straight line like a traditional platformer setup," says Langfield. "An additional gameplay element was added which allows the player to assist Mario by grabbing power-ups within physical space that are out of his reach and dropping them onto him." But Langfield didn't stop at gameplay, he also played around with the iPhone X and its TrueDepth camera to give himself a static yet fully three-dimensional Super Mario mask, which he shared on Twitter. Aside from the gaming nostalgia, Langfield also managed to give us yet another example of where Apple face-tracking selfie camera is going beyond Animoji, thanks to the efforts of independent developers. And remember, the iPhone X has only been in the hands of most for a little over a month, so we can expect AR selfies and masks to get even more interesting in 2018.